Both Russia and North Korea are the anachronisms of the 20th century power politics. Both countries failed to integrate into the contemporary global world order and continue to intimidate their regional neighbors and mislead their own populations. Both countries are under international sanctions for their aggressive intentions and nuclear ambitions. It is hardly surprising that the Russo-DPRK bilateral relations are improving and both peoples are increasingly sympathetic toward each other. The saddest thing about this growing friendship is in its ideological and desperate nature, which comes out of necessity and isolation. This marriage of convenience comforts both parties in their grief over the absence of better and happier relationships with those who refuse even to talk to them. The relationship may look strong on the surface but it’s lacking in substance. Ninety percent of Russians (especially those who support Vladimir Putin and his policy) view America as the Evil Empire that punishes anyone who refuses to dance to Washington’s tune. Moscow accuses Washington of using double standards in international relations, and sees North Korea as a victim of this unjust policy. Moscow understands that nothing will change in U.S.-DPRK relations until a progressive party in Seoul presses the White House to accommodate North Korea. Until then Moscow’s calls for the resumption of the Six-Party Talks, diplomatic recognition of Pyongyang, lifting of sanctions and other pro-engagement steps will continue to fall on Washington’s deaf ears. Russia’s plans to extend the Trans-Siberian railway through North Korea to South Korea is facing a major geopolitical hurdle. This project is a non-starter as long as the Korean War remains unfinished. Moscow’s plans of linking the two parts of the divided peninsula with railway, natural gas, and electricity lines is nothing but a pipe dream. Nobody will invest in infrastructure in a war zone, were the belligerent sides remain poised to precipitate “the sea of fire” upon each other. Moreover, rivalry between Russia and China for control over the cargo and passenger traffic may further impede the development of railway and port facilities across North Korea. The last five years saw Russia’s efforts to boost the sluggish relationship in many areas. High-level delegations stated frequenting Moscow and Pyongyang talking about friendship, cooperation and business. Their effectiveness remained symbolic until 2014, when Russia wrote-off the 10 billion US dollar debt, which North Korea accrued since the Soviet era. Only after this philanthropic move, did bilateral trade get a second wind: Russian rouble became the currency of payment for import/export transactions between the two countries; and 2015 is now celebrated as the Year of Russo-DPRK Friendship. Regardless of that, a nuclear North Korea is unacceptable to Kremlin for a number of reasons. Nuclear proliferation undermines Russia’s status of a military superpower and puts it in awkward situation where it will need to target North Korea to counterbalance the potential threat. Neither would friendly relations with the self-proclaimed nuclear North Korea help Russia maintain strong political and economic relations with South Korea. Russia would prefer to see the Korean peninsula nuclear-free, neutral and non-allied. For this, Moscow would support a multilateral agreement where Korea would accept the status of “permanent neutrality”, just like Austria after 1955. There is no place for nuclear weapons in this picture of peaceful settlement for Korea. Sixteen nations willingly rushed to Korea in order to support one side or the other in this essentially ideological conflict. Moreover, participation of the United States, China, and the Soviet Union made this war a focal point of the larger Cold War confrontation that erupted at the end of World War II. Even the reluctance with which the Armistice was signed by the UN, PRC and DPRK, greatly reflected the staunch willingness of participating sides (and their proxies) to continue this war just by other methods. The ideological stand-off between the two political and socio-economic models – Communism and Liberal Democracy – did not permit peace to be restored on the Korean Peninsula. It has been more than two decades since the collapse of the Communist Bloc, which culminated with the disbanding of the Soviet Union in 1991. The new Russia has gone through a difficult and, in many ways, traumatic experience of defeated in the Cold War. Swift but yet incomplete democratisation, economic agony and petro-dollar windfall resulted in the Communist Party and KGB bureaucrats returning to Kremlin and major changes in the attitudes to the country’s recent past. The restoration of imperial mentality, deep-seated chauvinism and militarism in today’s Russia is naturally accompanied by the resurrected anti-Western sentiments and the Cold War-like rhetoric of the past. Consistent with these changes are Russia’s official and popular approaches to the simmering conflict on the Korean Peninsula. These approaches have become increasingly redolent of the 1950s clichés, when Moscow, Beijing and Pyongyang struggled together against the foreign “aggressor”. In today’s Russia the word “Democracy” has become just a word of profanity, while the importance of democratic institutions is commonly ridiculed. In 2013, the Russian cabinet approved President Putin’s idea to create a new history textbook for high schools, “where historical narratives would be uniformed and officially approved”. What will be Russia’s “official and approved” version of the history of the Korean War? More importantly, how will it differ from the unofficial views of independent scholars in Russia and abroad? Is this change going to afflict Moscow’s long-term relations with Seoul and Washington? Will it modify the assessment of Soviet Union’s role in the inter-Korean conflict? This paper analyses the current position of Russian History and Political Science scholars on the sensitive issues of war and peace on the Korean Peninsula. Some Russian Korean Studies experts have quite refreshing views and offer sensible solutions based on the non-partisan approach to the Korean problem. Others are trying to be deliberately political, anti-American and pro-North Korean in their views. Their words can exacerbate old animosities and can even spark new regional diplomatic and academic conflicts by raising such controversial questions as “Who started the Korean War?” and “Who Won the Korean War?” Such topics remain to be passionately debated in the Russian blogosphere; and can be easily utilised by the neo-patriots who are willing to influence the process of “correcting historical accounts” by injecting doses of Soviet-era jingoism into this history-rewriting project. Divided into two parts, this paper will first examine contemporary Russian scholars’ opinions on the reasons why there is still no peace in Korea and what needs to be done to formally end the war. Declassified and published statistics of military personal and reports on destroyed or captured assets of the enemy will help juxtapose Russian and Western historiographies and reveal discrepancies between them. The second section, conversely, will project the possible damage that is being caused from the emerging popular views which might project the old Soviet stereotypes onto the new Russian myths about the Korean War. Depiction of the Korean War in Russian films, media and literary works will add to our understanding of how this conflict is understood (or otherwise) and why. Sources for this paper have been selected from a range of recent media publications dedicated to the 60th anniversary of ceasefire in Korea. Primarily, these are analytical works by contemporary experts from Russia and other countries of the Commonwealth of Independent States (CIS), speeches and memoirs of Russian veterans of the Korean War. The current controversy regarding the new official history textbook is also utilized here for the purpose of modeling the potential future damage for Russia’s international relations with its regional neighbors. These materials have been used to reconstruct the mainstream Russian attitude to the conflict on the Korean Peninsula, which seems to have made a major volte-face since the rise of the Putin administration in 2000. Nikolai Dubik, chief of state-run Russian gas company Gazprom’s legal department, said at a Korea-Russia Dialogue forum Tuesday KOGAS and Gazprom signed a memorandum of understanding on the timeline of project management in September, envisioning laying the pipeline from 2013 and supplying South Korea with gas from 2017. Lee told Medvedev it is true that South Korea is “very concerned” about the safety of the pipeline passing through the North given its military provocations last year. “We expect Russia to cooperate in finding solutions to North Korean issues, including denuclearization,” he added. The two leaders also called for comprehensive solutions to the North Korean nuclear issue for peace and stability in Northeast Asia, and agreed to cooperate to create a positive atmosphere for the resumption of the six-party nuclear disarmament talks. They also pledged to work for the success of the 2012 Seoul Nuclear Security Summit and the APEC Leaders’ Summit in Vladivostok, as well as for expansion of bilateral economic ties. The two leaders spoke at the closing ceremony of the annual Korea-Russia Dialogue, a civilian-led forum. Winding up his visit to Russia, Lee flew to Cannes Wednesday afternoon to attend the G20 summit. 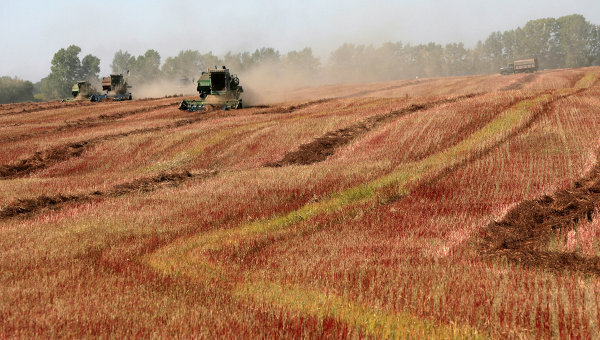 (BLAGOVESHCHENSK, September 1, RIA Novosti) A delegation from North Korea, which is facing severe food shortages, has held talks with authorities of the Amur region in Russia’s Far East on leasing land to grow vegetables and grain, a regional official said on Thursday. North Korea plans to rent several hundred thousand hectares of land in the Amur region, which has about 200,000 hectares of idle land in regional, municipal or private ownership. “The North Korean authorities are planning an unprecedented agricultural project – to create a farm in the Far East to grow soybeans, potatoes, corn and other crops. Everything that Korean citizens need, because the issue of food shortages there are acute from time to time due to land shortages,” the official told RIA Novosti. North Korean state media said the country’s chronic food problems have been exacerbated by heavy rains in June and July. A tropical storm washed away or inundated 60,000 hectares of land in farm regions. Amur region minister of foreign economic relations Igor Gorevoi said the land must not be abandoned. “We are also interested in investment in farm machinery and equipment. Another key condition is that the newly-formed Korean company must be registered in the Amur region, which means tax revenue for the budget,” he said. The initial lease of the land, which is to be auctioned off, amounts to 50 rubles ($1.70) a year per hectare. The Korean delegation plans to consider the terms of the lease next week. (Pyongyang, August 31, KCNA) — Some countries are seeking to diversify transport of energy resources to suit the worldwide trend of energy use and development. The DPRK and Russia are now discussing a gas pipe project. At the talks in Ulan-Ude, Russia, on August 24, the top leaders of the DPRK and Russia agreed to form working groups for the development of economic cooperation in various fields, including gas and other energy sector, and railroad connection. After the talks, Russian President Dmitri Medvedev said, “I ordered our organs to form a special committee. The committee will confirm detailed issues of bilateral cooperation concerning the program of gas transport through the DPRK.” In early August Russian Foreign Minister Sergei Lavrov announced that officials of the two countries held talks and discussed the prospect of the program. If gas experts reached the identity of views on the issue, the Russian government will support it in a political aspect, he said. 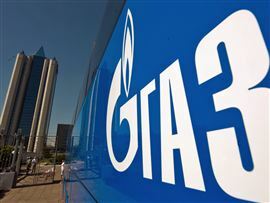 Russia is one of the world’s biggest nations in natural gas deposit and production and crude oil production. 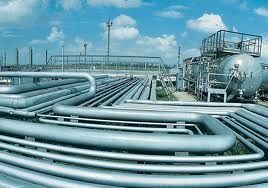 Russia, situated favorably for gas supply to Europe and other regions, is now interested in expanding its supply capacity. When the Sakhalin-Khabarovsk-Vladivostok natural gas pipe project with the annual capacity of 30 billion cubic meters, which was launched in 2009, is completed, Russia will be able to not only meet its domestic demand but have the capacity of supplying gas to Asia-Pacific nations. Russia plans to expand the energy supply to this region so that in 2020 crude oil and gas can take 30 percent from 3 percent, and 25 percent from 5 percent respectively in the country’s total export. The gas pipe linking Russia with the DPRK is important in the effort for fulfilling the plan. Speaking to reporters on August 25, Russian Vice-Minister of Industry and Energy Anatoli Yanovsky said the gas pipe project has been under deliberation for years and various proposals have been examined for the project, but it has been confirmed that the project will cost most reasonably in case the pipe is laid across the DPRK. Analysts also pay attention to the political significance of the project. Dr. Leonid Petrov at National University of Australia said the project will be profitable to all parties concerned. The joint energy program Russia and the DPRK are discussing at a time when many countries are trying to make an effective use of energy draws interest of the international community. (SEOUL, Aug. 26, Kim Deok-hyun and Lee Haye-ah, Yonhap) — This week’s rare summit between North Korean leader Kim Jong-il and Russian President Dmitry Medvedev was a “very important step” toward resuming the long-stalled nuclear disarmament talks with the North, Moscow’s top diplomat to Seoul said Friday. However, Russia’s Ambassador to ROK, Konstantin Vnukov, in an interview with Yonhap News Agency, admitted that there is a long road ahead for any resumption of the six-party talks, as North Korea must first demonstrate through action its commitment to denuclearize. “This summit in Ulan-Ude was a very important step in a very right direction, first of all to stabilize the situation on the (Korean) peninsula and to start calculation,” Vnukov said. Making his first visit to Russia this week in nearly a decade, the North’s reclusive leader held the summit with Medvedev on Wednesday in the Siberian city of Ulan-Ude and reportedly expressed his willingness to rejoin the six-party talks. After the summit, the Kremlin said Kim agreed to consider imposing a moratorium on nuclear tests and ballistic missile launches if the multilateral talks resume. South Korea and the U.S. gave a cool response to Kim’s reported pledge because they have demanded the North halt all of its nuclear activities and allow U.N. inspectors to verify the suspension before, not after, the six-party talks reopen. The six-party talks on ending the North’s nuclear weapons programs in return for economic and other aid have been stalled since late 2008 when Pyongyang abruptly left the discussion table. The North’s revelation of its uranium enrichment facility, which could provide the communist regime with a new method to make atomic weapons, in addition to its known plutonium-based weapons program, has added urgency to efforts to resume the six-party talks. One reason why South Korea and the U.S. reacted coolly to the Kim-Medvedev summit was that there was no mention of the North’s uranium enrichment program (UEP). Vnukov declined to confirm whether Kim and Medvedev had discussed the UEP, but added, “We also think it’s a very important problem and it should be discussed.” After his summit with Kim, Medvedev also said the two sides made progress on a years-long Russian proposal to ship large amounts of Siberian natural gas to South Korea via a pipeline to be built across North Korea. MOSCOW, Aug. 24 (UPI) — Russian President Dmitry Medvedev Wednesday reached a deal with visiting North Korean leader Kim Jong Il over a proposed gas pipeline to South Korea. Medvedev traveled to Ulan-Ude in eastern Siberia’s Buryatia region to meet with the North Korean leader, RIA Novosti reported. Russian gas giant Gazprom wants to build a pipeline to South Korea that would go through North Korea. The news agency said some reports estimate the project could bring about $100 million a year of much-needed hard currency to Pyongyang. “We’ve ordered our government bodies to establish a special commission … to outline the details of bilateral cooperation on gas transit through the territory of North Korea and the joining of South Korea to the project,” Medvedev was quoted as saying. The Russian leader said technical work on the pipeline would start soon. South Korea is one of the largest buyers of natural gas, with imports of liquefied natural gas from Russia alone totaling 1.5 million tons last year, South Korea’s Yonhap news agency reported. The report said North Korea reacted favorably to the project during the visit of Gazprom officials. In other developments, Kim expressed readiness to resume the six-party talks on North Korea’s denuclearization without preconditions, RIA Novosti reported, quoting Russian presidential spokeswoman Natalia Timakova… “During the talks, they will be ready to introduce a moratorium on the production of nuclear materials and on [nuclear] tests,” the Russian spokeswoman said. Kim’s talks with Medvedev also included likely food aid for North Korea, the report said. Kim, who is making his first Russia visit since 2002, arrived aboard his armored train last Saturday. Pyongyang, August 21 (KCNA)— Kim Jong Il, general secretary of the Workers’ Party of Korea and chairman of the National Defence Commission of the Democratic People’s Republic of Korea, visited Amur Region in the Far East Region of the Russian Federation on August 21. He arrived in Amur Region this morning. Flags of the two countries were seen fluttering at Bureya Railway Station and crowd was present there with pennants of the two countries in their hands. When the train pulled in the station, a military band played a welcome music and artistes of the Amur region folklore song and dance troupe danced to the tune of folk music. The crowd enthusiastically welcomed him, waving pennants of the two countries. He exchanged greetings with Oleg Kozhemyako, governor of Amur Region; Aleksandr Bashun, chairman of the Amur Region Legislative Assembly; Pavel Shtein, governor of the Bureya District Administration; and other leading officials of the region, city and district who came to greet him and Viktor Ishayev, presidential envoy to the Far East Region of the Russian Federation; and Valery E. Sukhinin, Russian ambassador to the DPRK; who were conducting him on a visit to the Far East Region. He was offered bread and salt by Russian women in graceful national costumes according to their customs. He was accompanied by Kim Yong Chun, member of the Political Bureau of the WPK Central Committee and minister of the People’s Armed Forces, Kang Sok Ju, member of the Political Bureau of the WPK Central Committee and vice-premier of the Cabinet, Jang Song Thaek, alternate member of the Political Bureau of the WPK Central Committee and vice-chairman of the NDC, Kim Yang Gon, Pak To Chun and Thae Jong Su, alternate members of the Political Bureau and secretaries of the WPK Central Committee, Ju Kyu Chang, alternate member of the Political Bureau and department director of the WPK Central Committee, Pak Pong Ju, first vice department director of the WPK Central Committee, O Su Yong, chief secretary of the North Hamgyong Provincial Committee of the WPK, Kim Kye Gwan, first vice-minister of Foreign Affairs, Kim Yong Jae, DPRK ambassador to Russia, and Sim Kuk Ryong, consul general of the DPRK Consulate General in Nakhodka of Russia. He visited the Bureya Hydro-electric Plant, a large power base in the Far East Region of Russia. He was greeted on the spot by Igori Goluptsov, director of the plant, and its senior officials. After being briefed on the history of the plant, he acquainted himself in detail with the construction and electricity production, going round the generating room and other places. Commanding a bird’s-eye view of the giant plant from the observation deck, he said it is a great structure to go down in the history of Russia. The director of the plant presented him with a gift which was prepared with sincerity carrying boundless respect and reverence of all its employees for him. 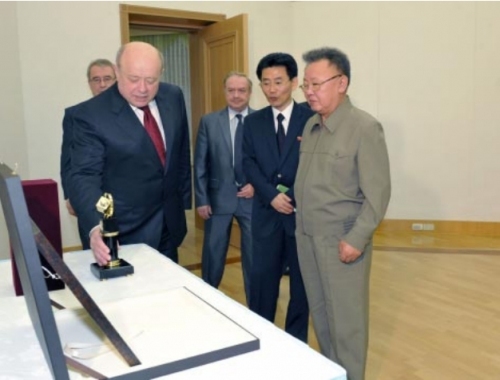 The governor of the region gave a luncheon in honor of Kim Jong Il on a visit to the region. Warmly welcoming Kim Jong Il visiting the Far East Region for the strengthening and development of the Russia-DPRK friendship on behalf of the Regional Government and people, the governor expressed the pleasure to receive in their region the leader in good health and full of energy. The luncheon proceeded in an amicable atmosphere overflowing with friendship. An art performance prepared by the artistes of the region was given in welcome of him. He was presented with a gift by the governor on behalf of the officials and people of the region in token of his historic visit to the region. He left for his next destination amid the warm send-off by senior officials of the region. MOSCOW, Aug 8 (Bernama) — Russia is in talks with North Korea to build a pipeline across the inter-Korean border to supply Siberian gas to South Korea, South Korea’s Yonhap News Agency reported Russia’s foreign minister as saying Monday. Building a gas pipeline across the two divided Korean states has long been a coveted project of Russia to sell its Siberian gas to South Korea, one of the world’s largest natural gas consumers. South Korea is a big supporter of the project but it has yet to be approved by North Korea. The two Koreas are still technically at war, with no peace treaty signed at the end of the 1950-53 Korean War. South Korean experts have said that the pipeline project, if successfully pushed, would give cash-strapped North Korea tens of millions of dollars a year in handling charges. After a meeting with his South Korean counterpart, Kim Sung-hwan, in the Russian capital, Russian Foreign Minister Sergey Lavrov said there currently are “contacts at the level of gas companies’ chiefs” in the three nations for the gas pipeline project. “If experts agree at the corporate level, all three capitals will provide political support,” Lavrov told a press conference. The Russian diplomat also said talks are underway on another major project to erect power lines across the two Koreas to provide South Korea with the secondary power of Russia. Lavrov said discussions are also under way to connect the Trans-Siberian Railway (TSR) and the Trans-Korean Railway (TKR), a project that experts say can help South Korea and even Japan transport European-bound exports overland. The two foreign ministers met as regional players are trying to re-open stalled the six-party denuclearization talks with North Korea. The forum groups the two Koreas, Russia, the US, China and Japan. Also speaking at the news conference, Kim said he and Lavrov had “in-depth” discussions about the current political situation on the Korean Peninsula. “Both sides agreed that the six-party talks, if resumed, should be substantial and practical,” Kim said. Lavrov urged the six-party members to rely on “peaceful, political and diplomatic means” to help restart the talks. Lavrov also said North Korean leader Kim Jong-il has been invited to visit Moscow “long ago” but the scheduling should be coordinated. 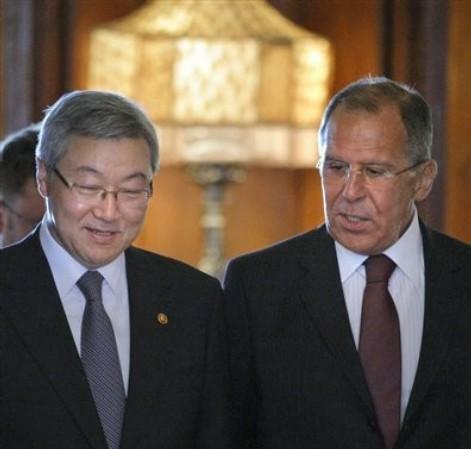 The Russian diplomat said Moscow and Pyongyang regularly discuss the situation on the Korean Peninsula. “We want (North Korea) to develop dynamically and to solve its international problems that would facilitate the normalisation of the situation in Northeast Asia,” he said. Lavrov said bilateral trade between Moscow and Seoul should reach a record US$20 billion in 2011 and added South Korean investments in Russia are on the rise. The two ministers said they also focused on expanding their relations, in particular through developing mutual projects in high technology such as space exploration and electronics. North Korea has made deep cuts to its logging operations in Russia in recent years due mostly to limited earning potential, worker unrest and the might of Chinese competition. However, Pyongyang is said to be also using military-run enterprises to develop some other business opportunities inside Russia, notably in construction. Following a 1967 agreement between the two countries, logging has at times played a key role in North Korea’s hard currency earning efforts, with more than 20,000 North Korean laborers being involved in forestry operations in Russia by the start of the 1990s. Under the agreement, Russia agreed to provide the trees, equipment and power, while North Korea would provide the labor, and both countries shared the timber. 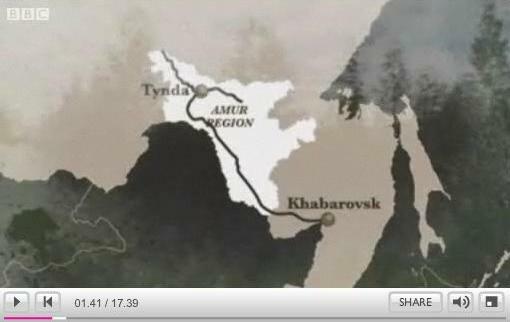 “In the past there used to be trade missions in Tynda and Khabarovsk, but now they is only the one in Tynda, with seven logging businesses underneath it,” he said. “The Khabarovsk trade mission has recently been closed down, and there are now a total of just nine logging operations underway in all of Russia.” The numbers of loggers has shrunk to “4,000 in Khabarovsk and 2,000 in other remote areas; a total that does not exceed 6,000,” Kim stated. Even the remaining forestry mission in Tynda is not large, with a president, chief engineer and vice-director working in parallel with a Party chief secretary, organizational secretary and propaganda secretary. Although each secretary has two or three workers under him, even with the National Security Agency staff that keeps tabs on the activities of the workers included in the total, the mission remains small. Elsewhere, however, there are actually tens of thousands of North Korean laborers in Russia working in fields including construction, agriculture and mining, including around 30% of the 6,000 nominally said to be involved in logging. Given the ever increasing number of laborers running away from their assigned workplaces, Kim speculated there could also be as many as 600 or more defectors residing in Russia. “In 2006 the Ministry of Forestry sent some cadres all over Russia to try and lure defectors back home, but these people had grown accustomed to living in Russia and nobody listened. There were 598 at that time, so it’s probably even higher by now,” Kim said. Naturally though, surveillance and control of the laborers is as severe as it has always been at the logging sites. Every week the workers are forced to participate in Party-led activities including mutual criticism sessions. The authorities are trying to limit the number of defectors by encouraging them to spy on one another, and the NSA has an intricate system of investigation to maintain order. Nevertheless, workers are sufficiently unhappy with their situation that defections continue to occur. In contrast with the view of certain media and regional experts, “During the early to mid summer period, Kim Jong-il is usually in bad shape and he doesn’t usually prepare for such meetings. However, the reasons for cancellations are in fact nothing to do with his physical state,” said the source. On the other hand, an official in Vladivostok last week was quoted as saying, “We are preparing for the visit of Kim Jong-il,” again raising the prospect of a meeting between the two leaders. A regional official related to the police then claimed, “Chairman Kim Jong-il’s visit has been cancelled,” shrouding the events behind the proposed talks in mystery. So was there ever really a planned meeting between Kim Jong-il and Vladimir Medvedev? “A meeting was informally planned,” related our source on May 21st, “but there were a number of issues which had to be resolved before it could go ahead.” One of those issues is the advance made by China into North Korea’s Rajin-Sonbong region and by implication therefore into Russia’s strategically important far eastern regions. “In his August 2008 visit to China, Kim Jong-il pressed Hu Jin-tao to sell North Korea its latest fighters. China refused and so North Korea turned to Russia and proposed summit talks,” reported one source. “Instead of talks the Russian’s proposed that North Korea provide it with high level top secret military information.” This was difficult for the North Koreans to accept and at a meeting of the Central Party Military Committee led by Kim Jong-il and Kim Jong-un in June, it was decided to decline the offer. However, according to a report out of Vladivostok in the Asahi Shimbun, July 1st, “A high-ranking official of the Russian government said, “President Medvedev and Chairman Kim are still consulting on the matter of a summit meeting. Any such meeting has not been permanently cancelled. Rather it is a question of until when it has been deferred.” How the two countries’ arms deal progresses is a matter worthy of observation. The first conclusion that can be drawn from the issue is that North Korea’s purchase of high tech Russian weaponry is apparently a matter of some urgency. Secondly, North Korea’s big power allies China and Russia no longer automatically assent to whatever North Korea may propose. They will take an approach to North Korea and the Korean peninsula which prioritizes their own national interests. The question that also must be addressed is why would the same North Korea that is begging the western world for food support be seeking to invest astronomical sums in high tech weaponry? When asked if it was reasonable to see it as indirect evidence that the North intends further attacks on the South, the source answered in the affirmative. The Joong Ang Ilbo carried a report on page 2 of its May 19th edition. “North Korea’s current construction of an air support base at Goampo in Hwanghae province just 50 kms from Baekryeong Island is a considerable threat.” quoting the opinion of a South Korean government officials related to the Ministry of National Defense. (Radio Liberty July 05, 2011) A delegation from Russian gas giant Gazprom has visited North Korea. North Korea’s Central News Agency said the delegation was led by Deputy Managing Chairman Aleksandr Ananenkov, but offered few other details. The news follows a report in May that a top Russian intelligence official had traveled to Pyongyang to discuss economic projects involving North and South Korea, the world’s No. 2 consumer of liquefied natural gas. According to an Interfax report in May, Foreign Intelligence Service director Mikhail Fradkov and North Korean leader Kim Jong Il discussed projects including a railway junction, a gas pipeline, and a power line from Russia to South Korea via North Korea. Russia’s “Kommersant” newspaper reported on June 30 that Kim had decided to cancel a trip to Russia due to worries about security sparked by media reports about the trip. Global Security Newswire (May 23, 2011) Russia on Friday said it has seen no solid intelligence to support assertions made in a recent U.N. expert panel report that North Korea and Iran are conducting illegal exchanges of ballistic missile technology, RIA Novosti reported (see GSN, May 17). The expert report submitted this month to the U.N. Security Council claims that Tehran and Pyongyang were routinely evading international trade controls to exchange ballistic missiles, technology and components. The report says much of the illegal missile trade was taking place through a nation that borders North Korea. Multiple anonymous envoys identified that country as China, which has blocked release of the report. “We do not have reliable information to suggest cooperation between North Korea and Iran, especially not on a regular basis,” Russian Foreign Ministry spokesman Alexander Lakashevich said. Under Security Council sanctions imposed as punishment for its nuclear and missile tests, North Korea is forbidden from exporting its missiles or related technology (RIA Novosti, May 20). 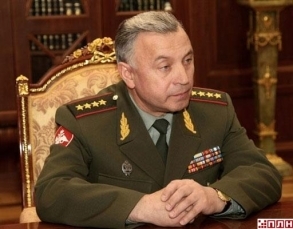 Russian army General Staff spokesman Vyacheslav Kondrashov on Friday asserted that neither Iran nor North Korea presently possess ballistic missiles capable of striking the United States or any NATO nation, Interfax reported (see GSN, May 19). “The threat of a missile attack against the world’s leading powers, including the U.S. and NATO countries, appears to be extremely insignificant,” Kondrashov said. The United States has cited concerns about the evolving missile capabilities of Iran and North Korea as the chief reason behind development of its missile defense capabilities. Moscow has been wary of U.S. antimissile initiatives and has argued that the Obama administration’s plan to establish a missile shield in Europe is a scheme to undermine Russia’s strategic deterrent (see GSN, May 20). “The U.S. assessments, whereby Iran and North Korea could soon have ICBMs, are quite remote from this level of development of missile technologies,” Kondrashov said (Interfax, May 20). (KCNA, 18 May 2011) Kim Jong-il met with Mikhail Fradkov, head of Russia’s Foreign Intelligence Service, according to an 18 May report in DPRK media. 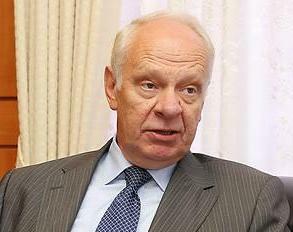 Fradkov served as Prime Minister of the Russian Federation from 2004 to 2007. 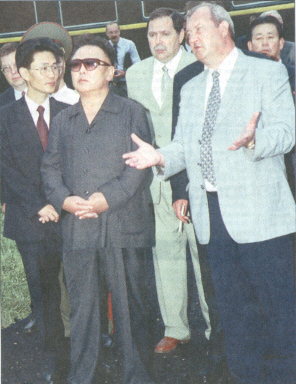 Fradkov’s meeting with Kim Jong-il proceeded in “a friendly and cordial manner.” KCI hosted a banquet for Fradkov after the meeting. Attending the meeting with KJI were: Senior Vice Minister of Foreign Affairs, Kim Kye-kwan (Kim Kye Gwan) and Senior Vice Minister of State Security and NDC Member, U To’ng-ch’uk (U Tong Chuk). On this, an anonymous South Korean government official is quoted as saying, “Vice Minister Ryu has not been seen since early this year. It seems he has either been purged or exiled. We are currently checking into the possibility of his execution.” Ryu is a major figure in North Korea, someone who has received a number of medals for uncovering alleged U.S. and Japanese spying rings within North Korea as a leading member of the National Security Agency. He has long been known as a sharp-witted and trusted associate of Kim Jong Il. (Arirang TV, APR 15, 2011) The North Korean embassy in Russia is under suspicion of hosting a casino in one of its office buildings. Russian newspaper “Izvestia” reported Thursday, that the Moscow-based embassies of North Korea and Belarus are operating underground casinos. A local police investigation has found that the North Korean embassy leased a building last September, to use as a cafeteria, but instead ran it as a casino from December. Only those who have made prior arrangements are allowed to enter the building. Russia enacted a federal law to ban gambling in July 2009, and foreign embassies have been preferred venue for casinos, as they are immune from jurisdiction. North Korea and Belarus have denied the allegations, saying that none of their embassies are used as gambling establishments. Pyongyang, February 12 (KCNA) — A reception was given at the DPRK embassy in Moscow on Feb. 9, 2011, on the occasion of the birthday of General Secretary Kim Jong Il. Present there on invitation were Aleksei Borodavkin, vice-minister of Foreign Affairs of Russia, deputies to the State Duma, members of the Federation Council and officials of the “United Russia” Party and other officials of the government, political parties, organizations and organs of Russia. Kim Yong Jae, DPRK ambassador to Russia, and staff members of his embassy in Moscow were on hand. The participants laid a floral basket and bouquets before the full-length painting of President Kim Il Sung and Kim Jong Il and paid tribute to them before going round photos on display. Speeches were made at the reception. The ambassador said that the birth of Kim Jong Il was a historic event which carved out the destiny of the country and the nation and guaranteed a bright future of the revolutionary cause of Juche. He recalled that Kim Jong Il has led the revolution and construction to victory for a long period. Expressing the hope that tangible achievements would be made in the development of the DPRK-Russia relations this year, he expressed the expectation that the Russian people would register greater successes in the work to increase the defense capability and achieve the country’s economic development and social stability. Borodavkin said that the agreement reached between the top leaders of Russia and the DPRK is in line with the interests of the two peoples and contributes to ensuring peace and security in Northeast Asia. InterFax.com (December 10, 2010) Foreign Minister of the Democratic People’s Republic of Korea Pak Ui-Chun in an interview with Interfax speaks about Pyongyang’s vision of the current situation on the Korean peninsula and has offered an assessment of Russian-North Korean cooperation in political and economic issues in the run-up to his visit to Russia. Question: Mr. Minister, how do you assess the present-day level of political cooperation between the Democratic People’s Republic of Korea and Russia? Answer: The agenda for my visit to the Russian Federation, due to take place on December 12-15 at the invitation of the Russian side, includes negotiations with the foreign minister of Russia, Mr. Lavrov, on issues surrounding bilateral relations and crucial international problems, as well as the signing of plans for exchanges between the Foreign Ministries of the two countries for 2011-2012. I should say that today Korean-Russian relations continue developing positively in politics, the economy, culture and a wide variety of other spheres in the spirit of joint documents signed at the highest level since the start of the new millennium. 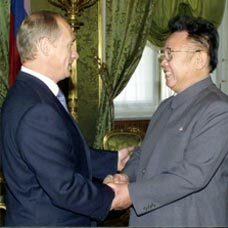 This year, which marks the 10th anniversary since the signing of the treaty on friendship, good neighborly relations and cooperation between the DPRK and Russia, the tenth anniversary since the publication of the joint Korean-Russian declaration, as well as the 65th anniversary of Korea’s liberation, has seen a vigorous exchange of delegations in various spheres. I am speaking about the visit to our country by the Russian regional development minister, who serves as Russia’s co-chairman of the intergovernmental commission for trade, economic, scientific and technological cooperation, as well as the visit to Russia by the land and environment preservation minister of the DPRK. Mutual trips paid by DPRK citizens and residents of Russia’s Far East, Primorye and Khabarovsk territories are more active than ever. Our great leader Comrade Kim Jong-Il and employees of the Russian Embassy watched the Eugene Onegin opera performed by our actors in February 2010 on the occasion of the 10th anniversary since the signing of the interstate treaty, as well as the joint May 1 concert given by artists from the two countries. Our countries vigorously cooperate in the international arena as well. Q.: What are the prospects for economic cooperation between Russia and the DPRK? A.: In my opinion, it is highly important to strengthen the economic component of our relations. The Democratic Republic of Korea, as a neighboring friendly state sharing a border with Russia, is particularly interested in promoting interregional cooperation. I am glad that our countries actively cooperate in various sectors of the economy, including construction, the timber industry, the fisheries sector and agriculture. Our agenda includes a series of promising and large-scale business projects. Q.: What is happening to the project of Trans-Siberian railroad and Trans-Korean railroad? A.: The Rajin-Khasan railway section and Rajin Port are being reconstructed as part of the first stage of a large-scale project aimed at connecting the Trans-Siberian Railway and the Trans-Korean Railway. I think that the practical results of our bilateral cooperation in the rail transport sector will have a positive impact on measures to expand bilateral economic ties as a whole and to boost interregional cooperation. At the current stage, it is necessary to speed up the reconstruction of the Rajin-Khasan railway section and Rajin Port as much as possible in compliance with earlier achieved agreements. We have consistently supported the further strengthening and development of friendship and cooperation through joint efforts by the two countries, which meets the core interests of our countries’ people and contributes to peace and prosperity in the region. Q.: Are the DPRK armed forces ready to launch one more strike on military facilities of South Korea and the United States? If they are, then under what conditions? Is the DPRK ready to discuss the escalation of tensions on the Korean peninsula at the six-party talks? A.: We think that it is necessary to take the right approach toward today’s acute military-political situation on the Korean peninsula. Recently the situation on the Korean peninsula has been in quite a dangerous stage, while inter-Korean relations are worse than ever. All this poses a serious threat to peace and security both on the Korean peninsula, Northeast Asia and the world as a whole. The main reason behind this escalation is the United States’ hostile policy in relation to the DPRK and the policy of confrontation with the North being pursued by the current ruling forces of South Korea. The U.S., having included the DPRK in the list of targets of a nuclear preventive strike, is pursuing a policy aimed at isolating and strangling it, while the ruling conservatives of South Korea, who are oriented toward external forces, have rejected all of the earlier reached inter-Korean agreements and are waging a campaign of confrontation with the Democratic People’s Republic of Korea. What is noteworthy is that recently the U.S., seeking to establish its military dominance in Northeast Asia and the Asia-Pacific region, has decided to reinforce the military triangle with Japan and South Korea, has intentionally been fueling tensions on the Korean peninsula, and has fiercely been conducting unprecedented large-scale nuclear military exercises. Following the U.S., South Korea has staged serious military provocations, holding large-scale military maneuvers one after the other. As for the artillery shelling that occurred near Yeonpyeong Island on November 23, this was the result of ill-considered and simultaneously systematic measures to unleash war on the part of South Korea’s belligerent forces, who, unsettling us from a military standpoint, seek to provoke an armed confrontation and to use it as a pretext to spark the flames of war. Like a thief, South Korea is shouting “Catch the Thief!”, falling all over itself to mislead the international community. Nevertheless, as it has already been announced in a press report of the Supreme Command of the Korean People’s Army and a press statement issued by a representative of the DPRK Foreign Ministry, during this incident we took resolute measures exclusively out of self defense and all of the required defense measures in response to the thoughtless military provocations staged by South Korean puppets, who were the first to open artillery fire in our territorial waters. We think that until the U.S. and South Korea abandon their hostile and confrontational policy toward the DPRK, it will never be possible to allay tensions on the Korean peninsula. We once again saw the rightness of our choice in favor of the Songun policy and the comprehensive strengthening of our self-defense potential based on nuclear deterrence forces. Q.: In your opinion what are prospects for resuming six-party talks on the Korean peninsula problem? What preconditions are required for this? A.: The denuclearization of the Korean peninsula is the goal set by our great leader Comrade Kim Il-Sung. Securing lasting peace is our unchanged position. Even amid the present-day atmosphere of extremely escalated tensions on the Korean peninsula, we would like to express our support for the resumption of the six-sided negotiating process based on the principles of respect for sovereignty and equality, as well as the “action-for-action” principle, envisioned in the joint statement dated September 19. We also came up with an initiative to conclude a peace treaty in order to establish a peace support system on the Korean peninsula. Nevertheless, the U.S. is opposed to the resumption of this dialogue, having chosen to keep silent on our peace treaty proposal and to strengthen its policy to strangle and isolate the DPRK. All of the countries involved that are concerned about the settlement of Korean peninsula problems should understand clearly who stands behind this escalation of tensions on the Korean peninsula and should take a position of responsibility. Заместитель секретаря Совета Безопасности России Владимир Назаров считает, что реакция КНДР является логическим следствием на поведение Южной Кореи. По словам Назарова, особенно тревожит последняя вспышка напряженности на Корейском полуострове. “Она является логическим следствием усилившейся в последнее время военной активности Южной Кореи и ряда их союзников. Учения, когда они проводятся вблизи линии разграничения между корейскими государствами и особенно в спорных районах, являются особенно провокационными”, – сказал заместитель секретаря Совбеза. Напомним, Пхеньян обвинял Сеул в безрассудной военной провокации. Позднее авианосная группа ВМС США вошла в южнокорейские территориальные воды для проведения учений оборонительного характера. BEIJING ― With Russia’s envoy Alexei Borodavkin in Seoul this week, the question of why Russia has refused to share its Cheonan investigation results with South Korea begs an explanation more than ever. The tragic incident in March remains the most instrumental event that has reconfigured the dynamics of inter-Korean relations and the regional security in East Asia where different stakeholders compete for leadership. After the incident, Moscow signalled to Seoul that it wanted to send its own investigators. Seoul honoured the request. Russia was not part of an earlier Seoul-led international inquest, which determined that the Cheonan, the 88-meter-long navy frigate, was torpedoed by a North Korean submarine, killing 46 sailors on board. The Russian investigators made a week-long probe, examining the Cheonan wreckage. After they returned home, however, Russia has oddly been keeping mum. So far, it has refused to release its findings to South Korea in what some observers see as a diplomatic insult. “Russia probably shared the results with China and the U.S., but not with South Korea to avoid open confrontation with Seoul,” said Leonid Petrov, a Russian expert on Korean affairs. In a recent conference in Russia, Borodavkin, who is deputy foreign minister for Asia-Pacific affairs, vaguely touched upon on the matter when he was asked about it by a reporter. Borodavkin said the investigation results were “classified” and were submitted only to Russia’s top leadership, adding it wouldn’t provide the results to either to South Korea or to North Korea. Russia’s silence has understandably aroused speculation. Donald Gregg, a former U.S. ambassador to South Korea, then jumped into the debate, saying the Russian investigation report was not released “because it would do much political damage to President Lee (Myung-bak) and would embarrass President Barack Obama,” citing a well-placed Russian source. Actually, according to him, focusing on whether Russia has any evidence that contradicts the international investigation is a flawed approach. In fact, he said Russia’s aim is more strategic. In the region, Russia forms another security bloc with North Korea and China. Petrov believes that the Russian move was following the recommendation of China. Just days before the Russian investigators arrived in Seoul, Russian Foreign Minister Sergei Lavrov flew to Beijing to discuss tensions between the two Koreas following the Cheonan sinking with top Chinese officials, including President Hu Jintao. But the Russian behavior of withholding its investigation results was seen as insensitive, if not insulting, by the South Korean side. “Russia’s behavior is rather rude since South Korea provided so much assistance to the Russian investigation team. It projected an impression that Russia believed South Korea didn’t deserve to know,” Petrov said. Although the Russia-South Korea ties have been strained with the unpleasant episode and albeit the damage has been done, Petrov nonetheless expects that the two countries will continue to move on with their relationship, not because they will eventually find a political consensus on the Cheonan matter, but because their mutual economic dependence will hold them together tight. “South Korea and Russia mutually need each other. Seoul needs to maintain its export capability. And Russia has the market to absorb South Korean products,” Petrov said. “Korea-Russia Workshop of Experts on National Green Policy and Environmental Evaluation” was jointly hosted by Korea Environment Institution (KEI), Korea University and Saint Petersburg State University, Russia at Saint Petersburg State University between Sept. 13 (Mon.) and 16 (Thu.). The workshop helped to build understanding of the national green policies of Korea and Russia, provide policy direction for green growth through the sharing of each other’s successes and problems, and build a network of experts for environmental evaluation and policy research. The four-session workshop took place for four days between Sept. 13 and 16 with presentations by 11 speakers, each followed by a discussion and technical trip on the last day. Korean participants in the workshop included Korea Environment Institute President Tae Joo Park, Korea-Russia Dialogue (KRD) Secretary General Jin Won Kim, Consul General at Saint Petersburg Seok Bae Lee and Korea Adaptation Center for Climate Change Chief Researcher Yong-Ha Park while Russian participants included Saint Petersburg State University Senior Vice-Rector Professor Gorlinsky, Professor Tronin, Arctic and Antarctic Research Institute Director Dr Frolov and St. Petersburg Research Centre of Ecological Safety of the Russian Academy of Science Director Donchenko. The workshop was sponsored by the Ministry of Foreign Affairs and Trade and National Research Council for Economics, Humanities and Social Sciences and hosted by the Integrated Environmental Research Group of Korea Environment Institute and KRD. KRD, a consultative body of private, government, industry and academy between Korea and Russia, was launched in April 2010 to build and strengthen strategic cooperative partners relationship between the two countries. On September 21, the Russkiy Mir Foundation and Russian National Committee of the Council for Security Cooperation in the Asia Pacific (RNC CSCAP) held a roundtable on “The Korean Peninsula: Challenges and Opportunities for Russia”. The event took place at the Crown Plaza Hotel in Moscow. The roundtable discussion began with a presentation of the report “The Korean Peninsula: Challenges and Opportunities for Russia”, prepared by a group of experts lead by Vyacheslav Nikonov, RNC CSCAP chairman and executive director of the Russkiy Mir Foundation. The report provides in-depth analysis of the political situation on the Korean peninsula. Presenting the report, Vyacheslav Nikonov noted that the entire world is closely following the political situation in the region. The Korean peninsula has been a source of tension over the course of several decades, the most recent crisis arising in March 2010 with the sinking of the South Korean corvette Cheonan, which Seoul blames on the North Korean Navy. The Korean peninsula is at the center of a rivalry between leading world powers, primarily the United States and China. The report, which was prepared by Russian experts, provides a detailed analysis of the dynamics of the development of the political situation on the Korean peninsula and the positions of the main players. “As far as Russia is concerned, its foreign policy since the early 1990s can hardly be called consistent with regard to North Korea,” Nikonov noted. The implementation of a consistent and balanced policy in relations with Seoul and Pyongyang, taking into account the economic interests of Russia, is one of the top priorities of our country in Northeast Asia, Nikonov stated. He also emphasized the importance of renewing the six-party talks with North Korea, South Korea, the United States, China, Russia and Japan. Russian Deputy Foreign Minister Alexei Borodavkin emphasized that the situation on the Korean Peninsula, “a relic of the Cold War, could become a turning point in Russia’s foreign policy in the region.” The political tensions on the Korean peninsula have reached a critical level, beyond which is open conflict, the diplomat noted. One of the most important foreign policy tasks of Russia in the region is to not allow the standoff to become an open conflict between South Korea and North Korea, whose nuclear potential threatens the security not only of South Korea but of many other countries as well. According to the deputy minister, responsibility for the situation lies with both North and South Korea. Mentioning specific aggravating factors, Borodavkin noted North Korea’s rocket and nuclear testing in 2009 as well as the large-scale joint military exercises of South Korea and the United States. 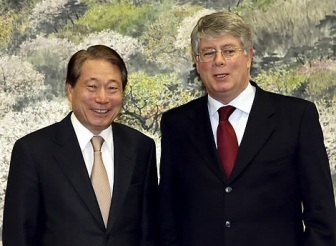 Concluding his remarks, Borodavkin noted that it is important for Russia to maintain good neighborly relations with both North and South Korea. Russia is interested in the development of economic relations, particularly with regard to energy and transportation. One promising project, he pointed out, was the construction of a railway link, which would create a direct transport line between the East and West, between the Asia-Pacific region and Europe. The report by Georgy Toloraya, RNC CSCAP coordinator, who recently returned from a trip to Seoul and Pyongyang, stimulated a lively discussion. Various assessments were given for the prospects of a nuclear-armed North Korea and the measures Russia should take in this regard. At the same time the experts found general agreement that the interests of all countries of the region, including North Korea, should be taken into consideration, and it is inadmissible to apply pressure in such a way as to destabilize the situation. Russia is interested in preserving stability and reconciling the North and South both in terms of ensuring its own security and security in the region and to foster the development of multilateral economic projects in Northeast Asia. “For the three decades that I have been following events on the Korean peninsula, I can count on my hands the number of times we have had such a divergent range of assessments of the situation and the intentions of the North and South, and unwillingness to make steps toward compromise,” Toloraya said. The report “The Korean Peninsula: Challenges and Opportunities for Russia”, which was prepared collectively by a group of academics, experts and diplomats, contains not only analysis of the political and economic situation in the region but also specific recommendations for overcoming the crisis in consideration of Russia’s interests. By Kang Hyun-kyung, The Korea Times July, 27, 2010. The South Korean government Tuesday denied a report by a local paper which said Russia believes an underwater mine, not a North Korean torpedo, sank the warship Cheonan earlier this year in the West Sea. The report, issued earlier in the day by the Hankyoreh newspaper, said that a team of Russian naval investigators had concluded that an external explosion consistent with that of a mine was responsible for the sinking on March 26. A Seoul official said on condition of anonymity that the government has not been informed of any updated information regarding the Russian team’s assessment of the Cheonan incident since July 8. At the time, the Russian foreign ministry spokesman told his South Korean counterpart that Moscow was reviewing the probe results found by a Seoul-led multinational investigation team. The official added that to his knowledge, Russia is still reviewing the results and has yet to reach a clear conclusion over the cause of the maritime disaster. The Hankyoreh report was based on a document titled “A Report on the Russian Experts’ Assessment of the Cause of the Sinking of the Warship Cheonan,” which the newspaper said it obtained from a source. According to the newspaper, the Russian experts held a different view about the cause of the sinking than that of the multinational investigation team. In May, experts of the multinational probe team pointed their fingers at a North Korean torpedo as the cause of the maritime tragedy by suggesting that a serial number engraved on a metal fragment of the torpedo provided the proverbial smoking gun. North Korea denied the findings, claiming them to be fabrications. According to the Hankyoreh, the Russian experts, who visited Seoul for a week in early June to assess of the multinational team’s investigation results, raised several questions regarding the findings. The Russian Embassy in Seoul said that it was not in a position to verify the report, adding it has not been informed of the Russian team’s assessment report. Meanwhile, Russia’s state-run media RIA Novosti reported last Saturday that the Russian experts were still unable to give any decisive answers over the cause of the sinking of the warship. Russian Navy Commander Admiral Vladimir Vysotsky was quoted as saying in a radio interview that “We still have questions about the results of the probe.” Whether the answers will come or not “doesn’t depend on us,” he said. Earlier, the U.N. Security Council wrapped up the Cheonan case by releasing a presidential statement condemning the attack. But the statement didn’t specify that North Korea was responsible for the maritime tragedy that killed 46 South Korean sailors. The Ministry of Foreign Affairs and Trade declined to give specific comments on the Hankyoreh report, reminding reporters of the fact that Russia signed the UNSC statement. Russian President Dmitri Medvedev and Prime Minister Vladmir Putin could visit South Korea later this year, the Russian ambassador to Seoul said. The G-20 Summit in November and celebrations of the 20th anniversary of diplomatic ties between Seoul and Moscow in September could bring both President Medvedev and Prime Minister Putin to Korea, Ambassador Konstantin V. Vnukov told reporters Friday. 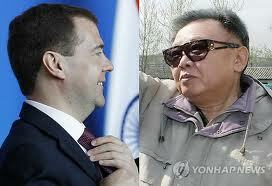 It’s certain that President Medvedev will be in Seoul for the G-20 Summit, he said. 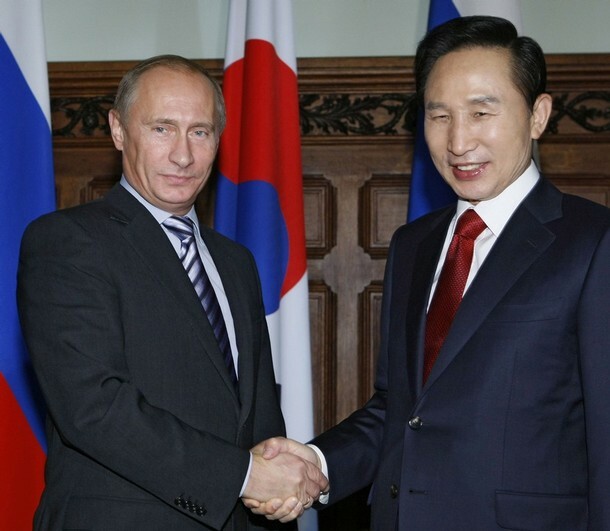 Regarding Putin’s visit, the ambassador said, “Putin was invited by Korea” as part of celebrations of the anniversary. A final decision has yet to be made as it approaches, and foreign ministers of the two countries are supposed to meet in Seoul and Moscow to discuss that matter, he added. The Korea-Russia diplomatic relationship is relatively young, only tracing back to the end of the Cold War. The two nations opened an official diplomatic channel in September 1990. Ambassador Vnukov said the two potential visits would certainly add value to the already expanding bilateral relationship. It gained momentum about two years ago when President Lee Myung-bak visited Moscow and had a summit with his Russian counterpart. They agreed to elevate relations to a strategic partnership level, which, according to a Korean diplomat, means intensified dialogue and exchanges. Ambassador Vnukov said the young relationship still has a lot of room to develop mutual understanding and interest. Although trade volume has grown significantly over the years, “It should be much larger, given the close distance between the two countries and the interests that we share,” he said. “We don’t know each other very well yet,” thus this year’s celebration will have a focus on diffusing each other’s cultural elements, he said. Among plans that are under preparation is a forum between top universities of the two countries. St. Petersburg State University and Korea University will be the main hosts of the private forum, which will be held later this year. Details of the forum will be discussed, he said. St. Petersburg State University and Korea University are where Presidents Medvedev and Lee studied, respectively. North Korea has always been mentioned in South Korea-Russia relations. Russia was the birthplace of Kim Jong-il and North Korea had kept very close contact with Russia until the end of the Soviet Union era. The ambassador said Russia would wholeheartedly welcome the summit between President Lee and North Korean leader Kim, if it happens. Russia is also a member of the six-party talks, a negotiation process aiming to denuclearize North Korea and thus make a nuclear-free Korean Peninsula. Ambassador Vnukov said Russia-led projects like the Trans-Siberian Railway and a gas pipeline project could be incentives for poverty-ridden North Korea, if it decides to scrap its nuclear program. The Russian government considers the six-party denuclearization talks as the best option to get rid of nuclear weapons on the Korean Peninsula. The ambassador, however, avoided answering the question of whether Russia had engaged in bilateral dialogue to convince the North Korean regime to come back to the negotiating table. The ideas of railways and a pipeline were brainstormed nearly a decade ago, yet no progress has been made due to North Korea’s dissent. “These projects will be possible under the condition” that Pyongyang gives up its nuclear ambitions, he said. The case of warship’s sinking is beset with many contradictions. One of them is a question. If it is true that “Cheonan” was sunk by a torpedo attack from a mini-sub of the DPRK, where did that mini-sub flee? Warships of the U.S. and south Korea equipped with modern monitoring system were busy with military exercises in those waters at that time. There are some assertions that the case was a politically motivated provocation. It is, therefore, necessary to clarify the cause of the warship sinking and ferret out the chief culprit. It is our view that the tension on the Korean Peninsula should not be escalated. The Golos Russii also quoted what a reporter of the Ria-Novosti News, Ivan Zakharchenko, said after looking round the hull of “Cheonan” displayed in a base in Phyongthaek, south Korea. He expressed strong doubt about the “results of investigation” made public by an “inspection team”. If the DPRK sought the so-called “retaliation” as claimed by the south side, why should it have conducted the operation at a time when large-scale joint military exercises were underway in the waters of the West Sea with even the nuclear sub of the U.S. forces equipped with an early warning system involved? he questioned. He held that south Korea used the case for adopting an arms buildup plan envisaging the shipment of many more weapons from the U.S., etc. while Japan exploited it for hastily retracting from its earlier decision on the pullback of all the U.S. troops from Okinawa where more than half of its forces in Japan are stationed. (The Joongang Daily, June 08, 2010) The team conducting Russia’s probe of the Cheonan disaster have concluded that the ship was sunk by an external explosion, according to officials from the South Korean joint investigation team. The three Russian experts returned home yesterday after an eight-day probe into the incident, which South Korea has concluded was caused by a North Korean torpedo attack. “The Russian team admitted the Cheonan sank due to an external underwater blast at its left side,” said the official, who asked not to be named. “But while they admitted that there was no possibility that the external blast was caused by anything other than a torpedo, the Russians never said that a torpedo sunk the ship.” The official also said he believed the Russian submarine and explosion experts “had detailed knowledge about the incident” even before they arrived in Seoul. The Russian experts inspected the ship, watched computer simulations that showed how a torpedo destroyed it, and Seoul officials also offered them the computer file that detailed how the simulation was created. The South Korean team also offered the Russians detailed records of the 2000 suicide bombing of the U.S. Navy destroyer USS Cole in the waters off of Yemen. Al Qaeda claimed responsibility for that bombing. MOSCOW (AFP) – Russia will not support efforts to punish North Korea for sinking a South Korean warship until it is fully convinced Pyongyang was behind the incident, a foreign ministry spokesman said Thursday. “We need to receive 100 percent proof of North Korea’s role in the sinking of the corvette,” the spokesman, Igor Lyakin-Frolov, was quoted as saying by the Interfax news agency. In a separate report, a senior source in Russia’s navy suggested that Moscow was unhappy about being excluded from the lengthy multinational investigation into the sinking of the Cheonan, a 1,200-tonne corvette. The investigation — which included experts from South Korea, the United States, Australia, Britain and Sweden — concluded last week that there was overwhelming evidence that the ship had been sunk by a North Korean torpedo. “With the participation of Russian specialists, the results of the investigation into the incident might have been more complete and objective,” the Russian navy source told Interfax. South Korea has cut trade ties with North Korea and is seeking diplomatic support for new United Nations sanctions against Pyongyang over the incident, seen as the worst provocation since the end of the 1950-53 Korean War. Pyongyang has denied any role in the sinking of the Cheonan, which went down in waters disputed by North and South Korea on March 26. As a permanent member of the UN Security Council, Russia has the power to veto any new sanctions against North Korea over the deadly incident. 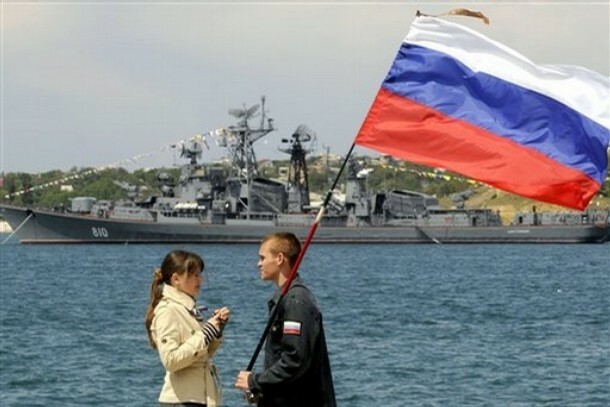 Russia, which has a short land border with North Korea, is set to hold major naval exercises in June in the Sea of Japan, close to the Korean Peninsula, which were planned before the current tensions broke out. 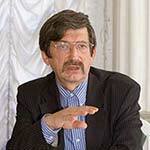 Leonid Petrov‘s commentaries given to Radio Free Asia on 28 May 2010. RFA: Russian government is reported to send it’s investigation team. Would you kindly comment on how it is going to affect Cheonan incident if they find the same result as the previous multi national team? LP: “The invitation of Russian and Chinese experts into the team of foreign investigators should have been done from the outset. It was strange to see the investigation team composed only of ROK’s allies (US, Australia, Canada, UK and neutral Sweden). This can only be explained by the sensitivity of joint ROK-US military and naval exercises which were going on in the area where Cheonan sank. Now, two months after the incident, inviting Russian experts does not make much sense because they will get access only to the second-hand evidence and convenient answers rather than the crime scene. I doubt that they will be allowed to inspect the incident site and examine the seabed as thoroughly as it was done by their predecessors. Russian President Dmitry Medvedev has signed a decree on Russia implementing beefed-up UN Security Council sanctions against North Korea over a nuclear test last year. Resolution 1874, toughening economic sanctions against North Korea and calling on UN member states to step up inspections of North Korean cargoes, was adopted unanimously on June 12, 2009, in the wake of an underground nuclear test carried out by Pyongyang on May 25. 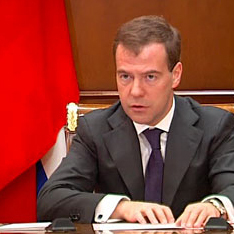 It was not clear what was behind the timing of Medvedev’s order. The presidential decree requires all government offices, enterprises, banks, organizations and individuals currently under Russia’s jurisdiction to take into account that since June 12, 2009, it has been forbidden to purchase any kind of weapons and materials connected to them from North Korea. Transit through Russian territory of all weapons and materials connected to them and exporting them to North Korea is also forbidden. “Security is being stepped up in Russia in order to prevent any such operations in accordance with Russia’s legal system,” the decree said. The decree also prohibits any financial aid for trade with North Korea, including issuing export loans, if such financial aid facilitates North Korea’s nuclear weapons program and its proliferation activities. “It is forbidden to take upon oneself new obligations to provide North Korea with grants, financial aid and cheap loans, with exception of those which are aimed either at pursuing humanitarian goals and … denuclearization or directly oriented at the needs of the civilian population,” the decree said. BEIJING – A magnitude 6.5 earthquake jolted border region between China and Russia on 18 Feb. morning, according to China Earthquake Networks Center (CNEC). The CNEC said that the quake struck at 9:13 a.m. Its epicenter was located at 42.6 degrees north latitude and 130.8 degrees east longitude — 110 km Northeast from DPRK’s Chongjin, 110 km Southwest of Russia’s Vladivostok, at a depth of 562.5 km. “I hardly felt any tremors when the earthquake struck,” said Jin Jianghu, a local resident in Yanji city in the northeastern province of Jilin. The province’s emergency office told Xinhua it had not received any reports of casualties. There were also no immediate reports of damages or casualties from the neighboring Heilongjiang Province which also borders Russia. A North Korean government official who has been detained in Russia after smuggling himself into the country wants to defect to Russia or other country, Russian security and other sources said Monday. It is rare that a case of a North Korean government official seeking defection in Russia has emerged. The 40-year-old man, who illegally entered the Russian Far East last September while working for a ministry related to industry, conveyed his desire for defection to the Russian government and the Office of the United Nations High Commissioner for Refugees, the sources said. With the international community tightening economic sanctions on North Korean entities for their alleged involvement in nuclear and weapons activities, Pyongyang is ever more eager to earn hard currency. One of the few options for the regime to get foreign dollars is to rely on its own labor exports. VOA’s Korean Service reporter Young Ran-jeon recently visited Vladivostok, Russia and filed this report voiced by Kate Woodsome. Pseudonyms were used to protect the workers interviewed for this story. In Russia’s largest port city on the Pacific Ocean, Vladivostok, several small-framed Asian men are bustling around a half-built apartment building, trying to move large metal beams. They are North Koreans sent out by their government to earn much-needed foreign currency for the country. Kim Dong Gil came from North Korea’s second largest city of Hamhung. He brags that North Korean workers have the best skills in the Russian construction market, which is also filled with laborers from Central Asia and Vietnam. The estimated 5,000 North Koreans in Vladivostok come from various backgrounds and even include doctors. Despite the stress of living and working in a foreign country, the North Koreans have come to appreciate the culture of capitalism. “Back home I couldn’t make money even if I wanted to. But here if I work hard, I can make a dozen times more,” explained Han Jong Rok. Choi Jong-kun, an assistant professor of political science at Yonsei University in Seoul, says money is just one reason to leave home. The other is improving one’s status among North Korea’s political elite. “If they bring in more money, then they would sort of have sort of upward mobility in their social class,” explained Choi Jong-kun. Communist North Korea has one of the most isolated and centrally controlled economies in the world. After the country suffered a deadly famine in the mid-1990s, the government allowed private farmers markets for a few years. But it tightened the policy in 2005. Pyongyang is known to pour money into weapons programs instead of public services. And it has kicked out many international development agencies, allowing just limited food aid primarily from China and South Korea. That has saved the population from starvation, but North Koreans still struggle with malnutrition and poor health conditions. Pyongyang earns foreign currency from South Korean companies employing North Korean workers at the Kaesong Industrial Complex. But opening up to cross-border commerce means opening up politically, too. Professor Choi suggests it is easier to send workers overseas than to deal with the impact of liberalizing the economy. North Korea does not reveal significant economic data, but exporting workers is considered a key source of hard foreign currency. A report by the Korea Institute for International Economic Policy in Seoul estimated in 2007 that Pyongyang earns at least $40 million to $60 million a year from labor exports. Outside of Russia, the institute has tracked North Korean workers in Kuwait, the United Arab Emirates, Qatar, Bangladesh, China and Mongolia. In Vladivostok, every North Korean worker is required to pay the Pyongyang government around $800 each month. Kim Soon Nam says he works extra hours to make sure he has money for himself. The North Koreans in Vladivostok usually get a five-year visa, but many get extensions to earn more money. They sleep in dormitories and live to work, spending much of their time outside the construction sites doing extra jobs in local Russian homes. Kim Chul Woong, a welder, says he is willing to sacrifice time from his family back in Pyongyang to give his son opportunities few North Koreans enjoy, like a computer. He says he is taking advantage of the work while he can get it. Kim Chul Woong says the construction jobs are dwindling in Russia because of the economic crisis. There is also greater competition from newly arriving Central Asians who are as hungry for dollars as he is. Additional reporting by Kurt Achin in Seoul and Kate Woodsome in Washington. Simon Ostrovsky has travelled to remote far eastern Russia and obtained rare footage of North Koreans who are working there as labourers under an agreement between their secretive Stalinist state and a company run by British businessmen. To the West, North Korea is a pariah state, best known for its secrecy, famines, belligerent politics and its leader’s brutality. At home, North Koreans live under total government control and the watchful eye of the Dear Leader, Kim Jong-il. But in the Amur region of Russia, almost 1,000 miles (1,600 km) from the border, North Korea has created a home away from home at a series of remote logging camps in which nearly 1,500 workers are employed. I travelled to one of the camps deep in the forest. 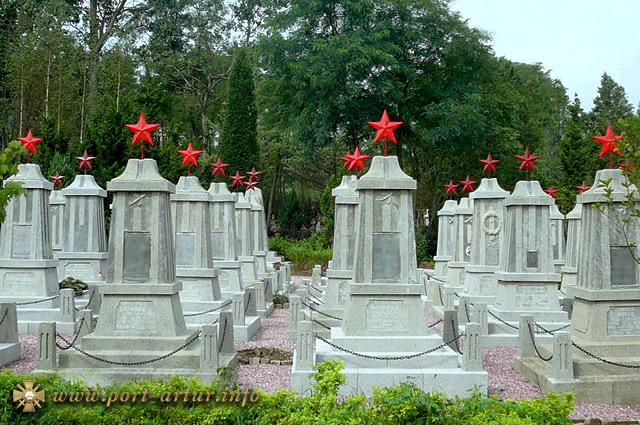 A giant monument bearing the words “Our greatest leader Kim Il-sung lives with us forever” stood in the middle. One of the buildings had a sign which read “Laboratory of Kim Il-sung’s Theory” a commonly used slogan found on North Korean administration blocks. The camp even had its own theatre. Further into the forest we found a group of North Koreans hard at work. They lived in a mobile wagon, decorated with portraits of the North Korean leaders. Although reluctant to speak, one told me that he earned the equivalent of $200 per month. Another said that he earned $1 for each truck he loaded and that he could load up to nine per day, but he had not been paid since May. To try to find out who employed the North Koreans I travelled to Tynda, where the headquarters of the region’s logging operations are based. I met Sergey Sarnavsky, the director of a small local timber firm which has a contract with Association No 2, a state-owned North Korean organisation. “The Koreans work year round with two days off per year,” he told me. “All the other days are working days no matter what the weather conditions, they always work. Many North Korean labourers have tried to escape the camps. Over the last two decades thousands have abandoned their work and now live in constant fear of arrest and deportation to North Korea. Branded enemies of the people by their homeland they are wanted by Russian police and their own country’s security services. “I was working endless hours. Twelve hours is normal in North Korea, but working 12 hours at the camps is very hard. In winter it’s very cold… It’s hard to work on an empty stomach. But the living conditions were the worst part. Russian human rights organisations are working with North Korean defectors. They say that often, after months of work, the labourers are underpaid and sometimes not paid at all. Svetlana Gannushkina’s organisation is assisting some two dozen former loggers who escaped before 2001 and are now living in hiding. I asked her what would happen if they were handed over to the North Korean authorities. So who benefits commercially now from North Korean labour in Russia’s Far East? The North Korean state, which provides the labour through Association No 2, take 35% of the proceeds from their logging operations in Russia – approximately $7m per year. The remainder goes to a firm called Tynda Les, who are owned by the Russian Timber Group – the largest logging firm in the region with around 1,400 North Koreans working on its sites. The Russian Timber Group was founded in 2004 by British businessman, Peter Hambro and a Russian business partner. Together they bought up a number of forestry rights across Russia covering an area roughly the size of Belgium. I asked Russian Timber Group’s CEO, Peter Hambro’s son Leo, if they had any control over the loggers’ welfare. He told me that the Russian Timber Group makes sure that the company which provides the workers complies with the Russian labour code and that they get regularly inspected. He also said that Russian Timber Group had no involvement in how much the workers are paid. “There is always going to be criticism… of any involvement with North Korea, especially as its been flagged by people like President Obama as an axis of evil,” he told me. *Simon Ostrovsky’s film was shown in full on Newsnight on Wednesday 26 August 2009 at 10.30pm on BBC Two. Russia is worried about North Korean missile and nuclear tests and has deployed sophisticated air defences in its Far East region to protect against any potential test mishap, Russia’s top general said here Wednesday. “We have an S-400 division there,” said General Nikolai Makarov, chief of staff of the Russian armed forces, confirming that Russia had deployed its most advanced anti-missile defence system near the border with North Korea. A Vladivostok, port de l’Extrême-Orient russe, à neuf heures d’avion de Moscou, l’essai nucléaire effectué par la Corée du Nord le 25 mai a causé bien des maux de tête. Non pas à cause du niveau de radioactivité – l’essai était souterrain, l’air n’a pas été contaminé affirment les météorologues -, mais du fait de l’inquiétude qui s’est répandue parmi la population. Les uns affirment avoir ressenti la secousse, d’autres s’inquiètent du prochain tir de missile balistique annoncé pour la mi-juin. Tous ont en mémoire l’incident de 2006, lorsqu’un missile nord-coréen avait dévié de sa trajectoire pour tomber près de Nakhodka, l’autre grand port marchand de cette Russie d’Asie…. In the Far Eastern Russian port of Vladivostok, a nine-hour flight from Moscow, the nuclear test carried out by North Korea on the 25th of May has caused quite a few headaches. Not on account of the level of radioactivity ­meteorologists confirm the test was underground, the air has not been contaminated ­ but due to the atmosphere of unease which has spread through the population. Some claim to have felt the shock, others are worried about the next ballistic missile launce announced for mid-June. Everyone remembers the incident in 2006 when a North Korean missile went off trajectory to land near Nakhoda, the other large commercial port of Russian Asia. “There a whiff of powder on the border”, headlined The Far Eastern News, the local paper, in its 27 May edition. “If North Koreans carry on nuclear tests, they will end in disaster”, the weekly gloomily predicted. Only 140 kilometres separate the city of Vladivostok ­ from North Korea. The border is well guarded, contacts between the populations inexistent. Eight thousand North Koreans are employed in the forestry camps but they are scarcely visible in town, unlike the Chinese who are active in all the marketplaces where they offer customers things Russia struggles to produce (electronic appliances, clothing, meat, fruit and vegetables). Locked up tight 20 years ago, the Russian-Chinese border has become a place of constant passage. Since 2001, Russians and Chinese have had no need of visas to go have a look at the other side. Nothing like that on the North Korean side. In August of 2001 the border post of Hassan witnessed the passage in top secrecy of Dear Leader Kim Jong-il’s armoured train, on its way on the ten-day journey to Moscow and St. Petersburg. On the occasion he was accompanied by General Konstatin Poulikovski, the Kremlin’s Far East representative, who escorted him on the entire rail journey, keeping him company at lunch and dinner each day. The General has got a book “Across Russia with Kim Jong-il” out of it. Obviously the company of the Dear Leader impressed him deeply. “Constantly I sensed his powerful aura”, he writes, dazzled by his “extraordinary ability to manage people” and his love of the colour khaki! In Russia, North Korea is a model which seduces not just the Russian military ­ army reserve general Leonid Ivachov passes regular vacations in Pyongyang ­ but also the pro-Kremlin United Russia Party. On Saturday, 30 May, the the regional branch of the party of what opponents call “the pen-pushers” held its annual conference in Vladivostok. The officials, a well-off caste, poured into the meeting in their Japanese 4-wheel-drives. Among foreign figures invited was the North Korean consul. Speaking before the delegates, he assured his audience that his country was going to continue its nuclear tests. He also invited Russia to take its place under the North Korean nuclear umbrella. The consul’s diatribe was not condemned by any of those present. No question of getting angry with a “brother party”. On the other hand, who covered the conference were told not to report anything about the matter. The territory’s administration imposed tight control on things by calling editors to make sure instructions are well respected. advantage of our role as intermediary on behalf of the international community”, explains Mikhail Terski, director of Valdivostok¹s Centre for Strategic Studies. Russia is all the more concerned about North Korean nuclear technology since, “it’s our own, that which we had provided to China, now the process is slipping out of our control, and we can’t do anything about it”, notes the geo-political specialist. …This newspaper approached Konstantin Asmolov of the Center of Korean Studies (Institute of Far East, Russian Academy of Sciences) for comments on what threats North Korea with its nuclear ambitions constituted. “Also importantly, the initiative South Korea pledged readiness to join stipulates examination of ships suspected of ferrying weapons of mass destruction. The DPRK in the meantime has a strong “besieged fortress” complex. Its military doctrine assumes that if it comes to a war, it will be a war against an alliance of the United States, South Korea, and Japan. Observing escalation of the situation or what they regard as escalation, the North Koreans might well decide that the war is imminent. Neither can we forget the existing level of mutual distrust. The North Koreans know that they lack sophisticated tanks and fuel and therefore see nuclear weapons as a factor of deterrence. Their military doctrine also stands for guerrilla warfare. This is what 200,000 men have been specially trained for. The enemy may even occupy North Korea, and that’s when they will come into play,” Asmolov explained. Question: Pyongyang’s demarches… How serious are they? 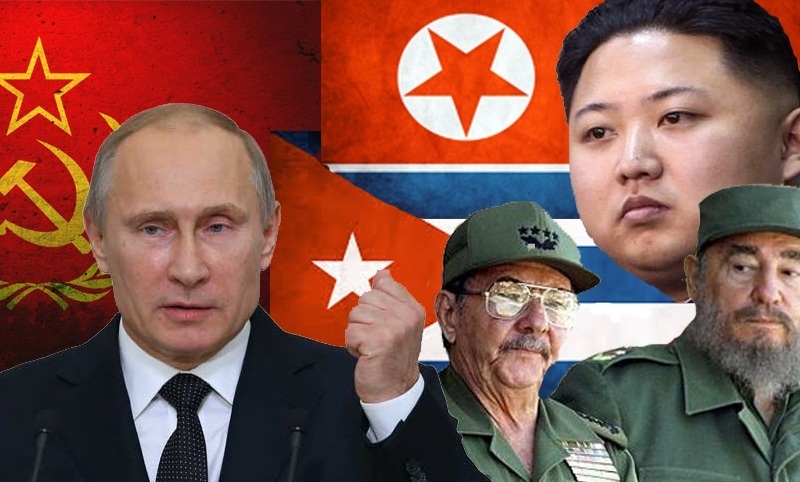 Konstantin Asmolov: The North Koreans keep issuing warnings. Pyongyang tested the international community and public opinion in the world, it wanted to know how serious Obama was when he talked about a constructive dialogue. The DPRK launched a satellite and gauged the reaction to it. If America really meant it, then it would have let it be without trying to present this episode as a ballistic missile launch. But America did make a fuss and the DPRK knew right away that nobody intended to be constructive or anything. Well, two can play this game, they decided. In a word, North Korea has only one option – it will probably keep upping the stakes waiting to see who is the first to snap under the strain. It will be either a war which nobody wants, or treatment of the DPRK as an odious but equal partner. It is not nuclear blackmail or anything. The DPRK does not escalate tension in the hope to get relief aid from abroad. It is equality that Pyongyang aspires to. Question: But what if it is a war, after all? Konstantin Asmolov: We’ve all heard about the colossal regular army of North Korea numbering 1,000,000 men. Anyway, regular army of South Korea is 650,000 men strong. This latter has sophisticated merchandise while the North Koreans use obsolete military hardware. Besides, military budget of South Korea equals 26 military budgets of North Korea. South Korean military experts used to tell me that should they find themselves face to face with the North Koreans even without help from the US Army (which is unlikely, by the way), they would certainly repel all attacks and take the war to the territory of North Korea. Also importantly, Pyongyang knows that the use of nuclear weapons will untie the hands of the international community. All bets will be off and all sorts of international retaliation will be possible then… In a word, let’s not present the North Korean leadership as a bunch of unpredictable tyrants. Last but not the least, there is a factor that directly concerns Russia. Bombardment of North Korean nuclear sites will bring the fallout to Vladivostok in a couple of hours. It will be a humanitarian catastrophe. Besides, Russia and China will have to deal with stampeding refugees from North Korea. 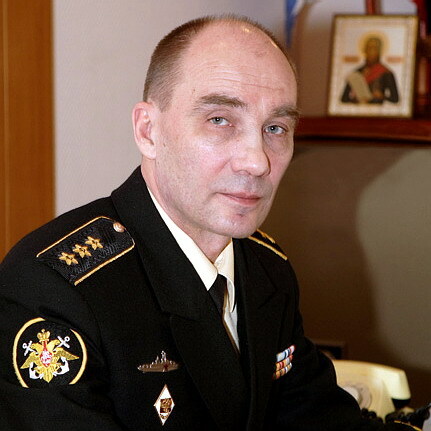 Moskovsky Komsomolets also approached Major General Vladimir Dvorkin of the International Security Center of the Institute of Global Economy and International Relations (formerly commander of the 4th Research Center of the Defense Ministry). “The nuclear test and the missiles they launch are elements of a campaign of blackmail. Also importantly, they are supposed to have a certain effect on the population of North Korea itself. Their economic situation is disastrous. Official Pyongyang sends a message to the population: sure, we spend a lot on weapons but we can defend ourselves now. 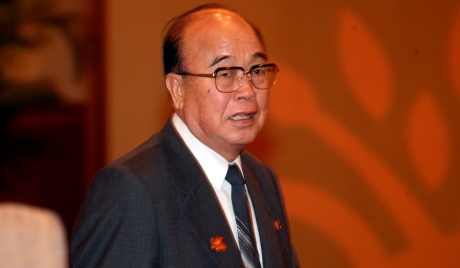 It does not matter to them that nobody intends to attack North Korea,” Yesin said. This newspaper approached Konstantin Kosachev of the International Committee of the Duma for comments. North Korea will stay away from international nuclear disarmament talks, Foreign Minister Sergei Lavrov said Friday after visiting the secretive state and pressing Pyongyang to return to the sputtering discussions. North Korea, which raised regional tensions with a defiant rocket launch earlier this month that was widely seen as a disguised test of a long-range missile, can send satellites into orbit on Russian rockets, Lavrov said after leaving North Korea. North Korea responded to UN punishment for the launch by saying it would boycott the nuclear talks with Russia, China, Japan, South Korea and the United States as well as restart a plant that makes arms-grade plutonium. “North Korea at this point does not intend to return to the six-party talks,” Lavrov told reporters in Seoul. Lavrov, the first high-level envoy from a global power to visit the reclusive North since after the launch, and South Korean Foreign Minister Yu Myung-hwan agreed to work together to have North Korea return to the nuclear talks, Yu said at the joint news conference. North Korea, arguing that it has the right to have a peaceful space program, said it sent a satellite into orbit in the April 5 launch. Lavrov, who delivered a message from President Dmitry Medvedev to the North’s leader, Kim Jong Il, said Russia stood by the UN move to chastise Pyongyang and tighten existing sanctions that limit the North’s arms trade and imports. Lavrov did not meet Kim. While Lavrov was in North Korea, he also attended the opening of a Russian language school at the Pyongyang Institute of Foreign Languages. “I am sure the Russian Center we are opening today will be one of the best abroad,” Lavrov said, noting that it was one of the first opened under the auspices of the state’s Russian World foundation, Itar-Tass reported. The Russian Center occupies an auditorium on the seventh floor in the main institute building, the report said. It has computers, a collection of audio and video materials and a library. Russian is the second most popular foreign language in North Korean schools after English, the report said. SEOUL (Yonhap) — Russia does not acknowledge North Korea as a nuclear power and will continue working with regional allies to persuade Pyongyang to give up its nuclear ambitions, Moscow’s envoy to Seoul said on Jan. 21. Gleb Ivashentsov, Russian ambassador to South Korea, said regional stability is “crucial to Russia’s economic development,” as Moscow is pushing for increased natural resources development in Siberia and the Far East. North Korea detonated its first atomic device in 2006. The relatively small underground test had less than a kiloton in yield, below what is considered a successful nuclear test. “The explosion occurred just 177 kilometers from Russian territory, so this issue has direct repercussions on Russia,” the envoy said in a speech at a forum hosted by the state-run Korean Global Foundation. Stalled negotiations aimed at terminating North Korea’s nuclear weapons program are expected to move forward only after the United States, a member of the six-party talks, rolls out its North Korea policy under the newly inaugurated Barack Obama administration. North Korea claims it has joined the ranks of nuclear nations with its 2006 test. Participants of the nuclear talks — also including South Korea, China and Japan — reject the North’s position. The envoy said Russia’s energy project in its eastern region will be “as large as the development of the American West.” “Russia needs security guarantees in neighboring countries for it,” he said. To break the impasse in inter-Korean relations, the envoy suggested Seoul and Moscow push for joint economic projects, such as connecting the Trans-Korean Railway and the Trans-Siberian Railway that runs across Russia. South Korea may opt for an undersea pipeline to receive Russian natural gas if North Korea refuses an overland route, says the state-run gas company’s head. “The plan to build an underwater pipeline came up during talks with Gazprom President Alexei Miller and experts at Russia’s Pacific Ocean Institute in Vladivostok last week,” Choo Kang-soo, head of Korea Gas Corp., said Wednesday to the Yonhap news agency. In September, Korea Gas announced it will import 7.5 million tons of gas annually from Russia starting in 2015 using an overland pipeline through North Korea. However, Yonhap quoted Choo as saying Russian gas company executives hinted Pyongyang officials they met with recently may not support it because of strained relations between the two Koreas under South Korean President Lee Myung-bak’s conservative government. Earlier this week, North Korea said it will tighten crossings through the border with the South beginning next month, the report said. Choo said the Russians suggested an undersea pipeline linking Vladivostok with either Samcheok on South Korea’s east coast or Busan, the country’s largest port. He said while an undersea pipeline would cost more “it is not technically impossible,” the report said. Choo indicated the overland route may still be possible as North Korea also needs access to natural gas. WASHINGTON – The spectacle of a renascent Russian military powerhouse flexing its muscles in Georgia conjures images of Moscow’s search for power in northeast Asia – and raises the question of the degree to which Russia’s current leaders see the Korean Peninsula as a future battleground for political and economic influence. The fear of Russia, an abstraction in South Korea, may be more acute in Pyongyang, where Moscow has been alternately a benefactor and a bully ever since installing Kim Il-sung as leader of North Korea after World War II. Great Leader Kim and son Dear Leader Kim Jong-il, who took over power 24 years ago after his father’s death, “always said Russia was more scary than the United States”, said Kim Dong-su, a former North Korean diplomat who defected in 1998. They believed, he said, that Russia would be “the first to do harm in case anything happened”. The sharp rise of oil and gas prices has enabled Moscow to utilise its mammoth energy reserves to achieve domestic and foreign policy goals. The new Russian ‘power politics’ have already been tested on the Baltic States, Belarus, Ukraine, and recently the Czech Republic. Russia’s Far Eastern frontier is now turning into the place where energy export becomes a political tool in shaping the country’s relations with regional neighbours. China, the two Koreas, and Japan are hungry for energy, natural resources and, at the same time, strive for economic and political cooperation. In such circumstances, the opportunities offered by trans-national railroads and pipelines appear to be more powerful than weapons. Given this new leverage and understanding, can Russia exert its soft and hard power upon North Korea in promoting the goals set in the Six-Party Talks?